The white and green building that houses the Naz Care Home in south Delhi looks no different from the other two-storey houses in the lane—if anything, it is prettier. Inside too, red, green and yellow walls are covered with black and white photographs of beautiful, smiling children who live in the home. As I walk up the stairs around 4pm to the dormitory which houses 35 HIV positive children (the youngest is 20 months old and the oldest 15 years), I am greeted with a cheery “Hello didi" many times over. A batch of 12 kids is waiting in the playroom adjacent to the dormitory to start an art and craft activity. On a previous visit, I had been told by Mita*, 6, that besides paints, I should get some sequins too. I have brought those in three colours—pink, blue and gold—along with small round mirrors, and 30 earthen diyas. In a matter of seconds, the number in the room swells to 20, with some of the older children who had been loitering around joining in. “Mujhe pink glitter milega (May I get pink glitter)?" “Hume broosh nahin mila (I did not get a brush)." “Didi, ek aur diya mere dost ke liye do na (Didi, please give me an extra diya for my friend)." I scramble to fulfil the requests—doling out the sequins, brushes, Fevicol tubes, ice-cream sticks, glitter and paints. Meanwhile, the children have spread old newspapers on the floor and divided themselves into groups of three and four on their own. Over the next hour or so, between demands for more Fevicol and glitter, the children seek comments from Sonu bhaiya (a counsellor with the home) and me. Their faces light up when either of us compliments them on how well they have coloured the diyas, or how cleverly they have used the glitter. Most children at the Naz Care Home are orphans abandoned by their immediate families because of the disease. They have come through other NGOs and hospitals. Some have a single surviving parent who is also an AIDS patient and cannot take care of them—and hence has left the child here. “We have a lifetime commitment to them. They can stay with us as long as they want," says Anuradha Mukherjee, programme manager. Naz Care Home, which was started in 2000, runs on donations from well-wishers and individuals—people like the local rationwala have made a difference. “Ever since he found out about our work, not only does he give us a discount on the bill but sends Rs1,000 every month as donation," she says. Girls from the nearby Lady Shri Ram College come in regularly to mentor the children, help them with studies and teach them to speak English— something the home authorities believe is an important life skill that can help the children to become self-reliant as they grow older. The care home holds workshops for the volunteers to explain that the HIV virus is not transmitted through touch or by being around people who carry it, so that they are totally at ease when they work with the children. “Contrary to what people think, these children will grow older and healthy, and need skills to be self-reliant and earn. That’s why we want them to study, learn music and computers and yoga," says Mukherjee, adding that in the last eight years only one child has died at the home—and that too, because of pneumonia. The children are enrolled in a nearby school run by another NGO* and Mukherjee proudly informs me that 10 among them are in the toppers’ list. “Once a child is tested positive, family members give up hope. We have a 10-year-old girl, Asha*, who came to us weighing only 10kg. Forget knowing how to read and write, most are severely malnourished. Here we aim to provide them with more than adequate nutrition, medical supervision at all times (they have a doctor on call 24 hours a day and psychologists visit twice a week) and give them a home—a place where they are accepted." Of the 35 children, only 12 are aware that they are HIV-positive. “They are 10 years or older and two years ago we sat them down and explained to them what HIV means and what it does to the human immune system. As they grow older, it is better that they learn the facts from us rather than from outside." The rest are too young, and though they question the need for regular medication, they are told it is to build up their immune system. Money: You can sponsor a child for a month for Rs5,000 (this will include education, extra-curricular activities, food and medicine, hospital visits and tests). The same amount will also provide a day’s meal for all children at a centre. DD/cheques should be in favour of “Freedom Foundation" and payable at Bangalore. Time: Opportunities are available on a need basis on weekdays between 9am and 5pm. Money: Sponsor a child’s monthly stay (excluding Anti Retroviral treatment— ART) for Rs3,500. 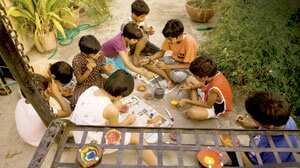 A child’s monthly ART can be sponsored for Rs2,000. Time: Celebrate birthdays, etc. or organise picnics for the children. Help to arrange awareness programmes on HIV in nearby schools and villages. Money: You can donate funds for the Nanhe Sapne project, which works at raising awareness levels about HIV among street children, adolescent girls living in rural and slum communities, and the HIV-infected and affected children at Sanjay Gandhi Transport Nagar and Narela in New Delhi. The money will be used to provide midday meals, milk, fruits and medicines to these children. Time: You can spend time with the children, but it is best to discuss the activity you want to conduct with the programme coordinator first.